Adult Indian Meal Moths have a wing span of approximately 5/8 inch long. When folded at rest, the top 1/3 of the wing is tan colored and the remainder will be reddish copper in color. Indian Meal Moth larvae are approximately 5/8 inch long and usually dirty white in color but may also be pinkish or greenish. The Indian Meal Moth is a global pest and may be found anywhere that its wide range of food sources may be found. Indian Meal Moth larvae eat grain and grain products, dried fruit, seeds, candy, chocolate, crackers and nuts. Preferring course flour, this pest will more often be found in corn meal, whole wheat and graham flour. Indian Meal Moth larvae are also frequently found eating bird seed, dried pet food, dried red peppers and dried flower arrangements. The adult Indian Meal Moths do not eat. Signs of an Indian Meal Moth infestation include larvae or webbing mixed with frass inside packages of the stored food products listed above. Other signs include cocoons, which the larvae spin, in crevices or ceiling/wall joints near their food sources. After hatching from cocoons the adult Indian Meal Moths may be seen flying mostly at night and in an erratic pattern. The coloration on the bottom 2/3 of an Indian Meal Moth’s wing is the result of scales which may become detached with age. Adult Indian Meal Moths do not eat, they live approximately 2 weeks with their sole purpose being to create the next generation. Although the origin of an Indian Meal Moth infestation is usually a food product stored inside the home this is not always the case. 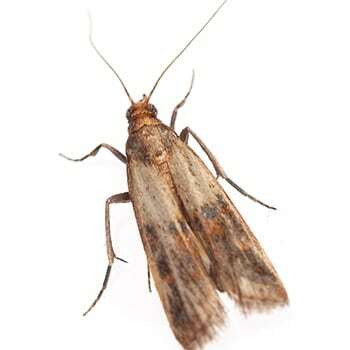 Adult moths may also enter a home from an outdoor source such as bird and squirrel feeders or rodent or squirrel nests.